Fate can be a funny thing and it would soon step in and force my hand – so to speak. 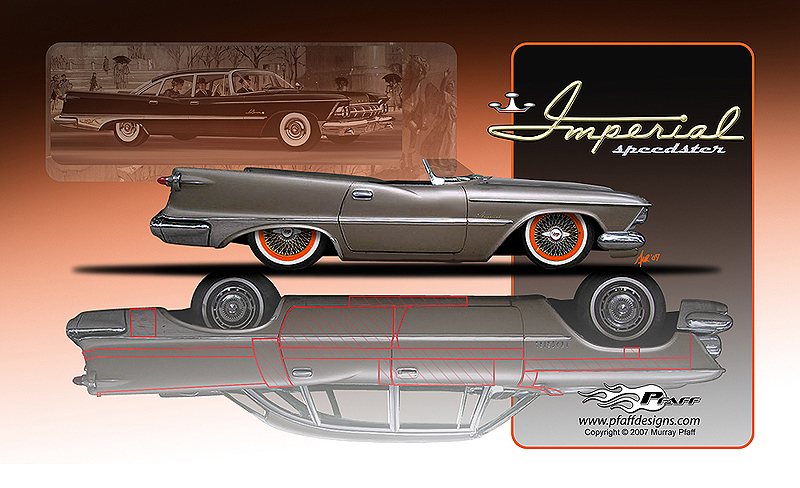 Just a couple of weeks after putting together a quick drawing creating the “Imperial Roadster” I was home in Northern New York visiting my parents. My Father was flipping through some of my new designs and he saw the little roadster. After mentioning that I based it on the parts from a 1959 Imperial, he informed me that he knew a guy that had mentioned he had an “old” Chrysler stored in a barn. An “old” Chrysler can cover a lot of cars. I asked him if he knew anything more than that and he said he wasn’t even sure his friend knew what it was. So when he asked if I was interested in looking at it, I said “no”. Given that the owner didn’t seem to know much about it I figured it probably was an 80’s K-car. If I was lucky it might turn out to be a ’76 Cordoba. I was only home for a day and I didn’t want to waste my time on a wild goose chase. It only took my inner car guy about fifteen minutes to re-emerge and say “you dummy”. I know better than to turn down an opportunity to look at a car in a barn. So my Dad calls the guy and we go over first thing the next morning. It’s a short drive over to the Lake Ontario town of Sackets Harbor, NY. We pull up to a carriage house located right on the main street of town. The neglected building is shedding paint and leaning to one side. The owner “Giz” informs us that he had it straightened “not too long ago”. The whole thing is tilting so far that the doors are wedged shut and we have to unbolt the front sliding door and lay it on the ground. It almost seemed like we were raiding a tomb. With the front of the building opened up and the daylight streaming in, we are greeted by the front of a large 50’s or 60’s car covered with a blue tarp and sinking into the wooden floor. I think to myself – this could be interesting. I lift up the first foot of the covering and see chrome letters spelling “IMPERIAL” – oh boy, really interesting! As I make my way around the side and to the back I find bullet taillights with the Saturn rings and the stamped spare tire ring in the trunk lid. 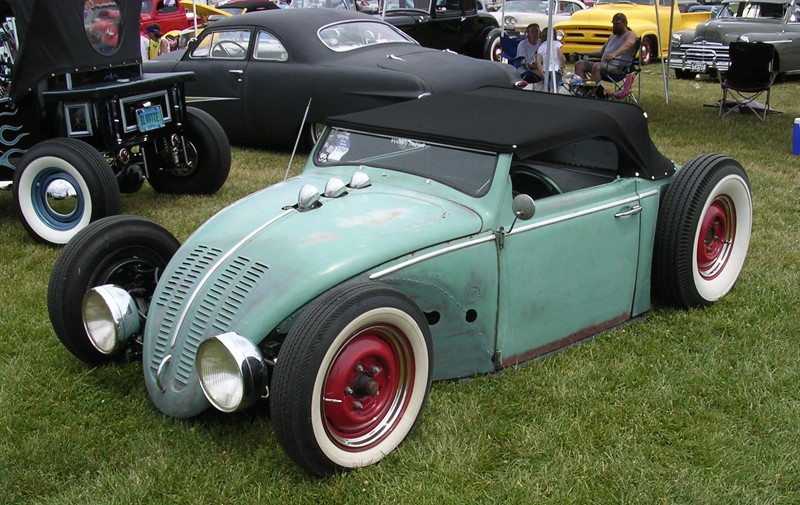 I nudge my Dad and say “don’t look excited and give it away, but this is the exact car I need to make the roadster”. Unbelievable! 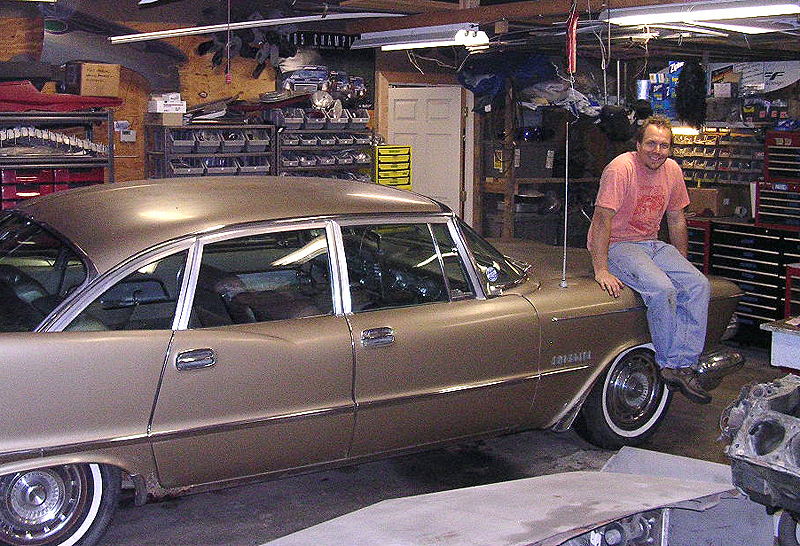 An Imperial Crown Custom emerging from its rest of 35 years. Is it fate? Do I really need another project? No. Do I really want another project? No. Do I have the room for it? No, and the questions don’t stop there. Will this guy sell it? How much? How do I get it home to Michigan? Do I have what it takes to build my little roadster? Should I buy it? No seems to be the answer to most of the questions. After a closer inspection the car seems really nice. There aren’t any signs of serious rust, the floors are solid, the interior is unmolested and it is all there – every last nut, bolt, and piece of trim. Giz informs me that it was put away in 1972 because he couldn’t afford insurance on it, then there was an oil embargo in 1974. The car is 19’ long and weighs just under 5,000 pounds with a 413 Wedge powering it. With only 52,000 miles on the odometer he thinks it should start, but the rusted valley cover exposing the lifters says otherwise. So even if someone were to restore it, it would require a thorough re-build. 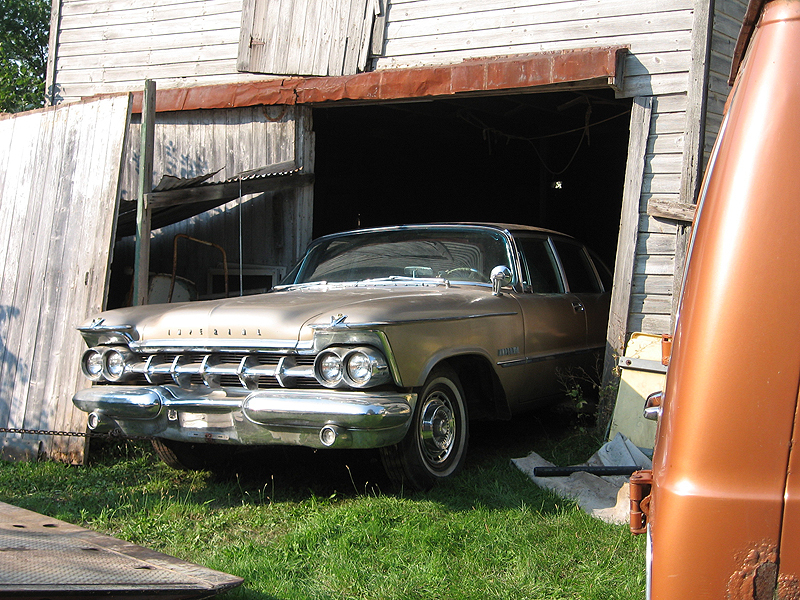 So at this point it is pretty unanimous that I should pass on the chrome laden land yacht – right? Wrong – that inner car guy is back and he won’t take no for an answer. I don’t want the car for all of the right reasons, but instead I want it for the wrong reason. That reason is just because I want it, plus its fate – right? Giz says he should probably sell it. I agree and tell him he should get rid of it before winter comes and the roof falls in on it. Well we don’t strike a price that day, but a week later my dad calls and asks if I am still interested in it. Dad had just seen Giz and made a deal for just a hundred dollars more. I am ecstatic and scared all at the same time. 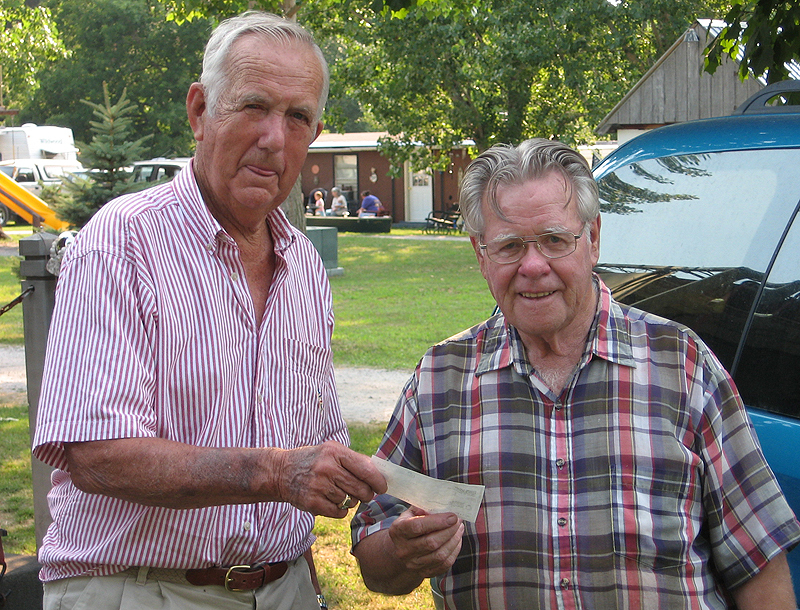 My Father on the left, handing over a check to Giz on the right. OK – so I can’t stop thinking about that little VW roadster. It’s really made an impact on me. Add to that it was built over just a few months! I really hate hearing stories like that, partly due to the fact that I simply can’t believe it, mostly due to the fact that I am jealous that I probably couldn’t pull off a build of a car so quickly. Could I do something so quick and effective? Probably not. 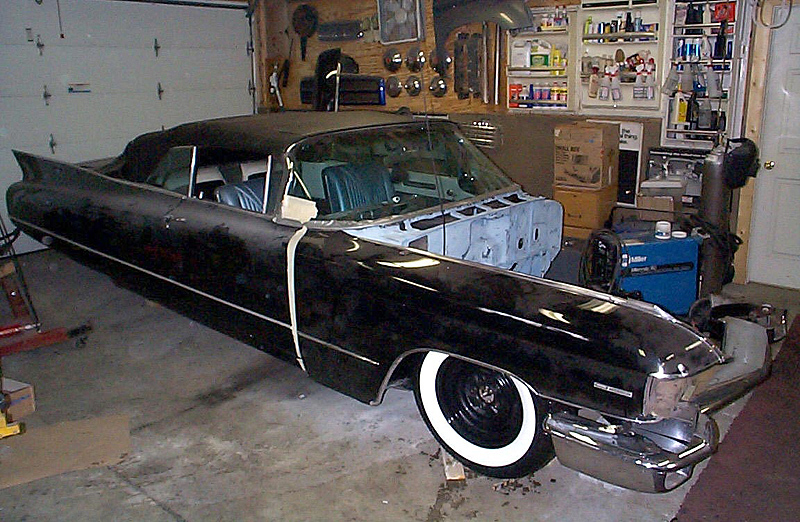 I already have a 1960 Cadillac Convertible sitting on jack stands in the garage. It’s the first car that I set out to do a “low brow” make-over. It already got set aside once so I could make over “FireMaker”. And now it is still collecting dust waiting for a big mill Cadillac, Ford 9”, custom front bumpers, body mods, wide whites and Radirs. I really shouldn’t be thinking about another project before finishing the last one – but I am. 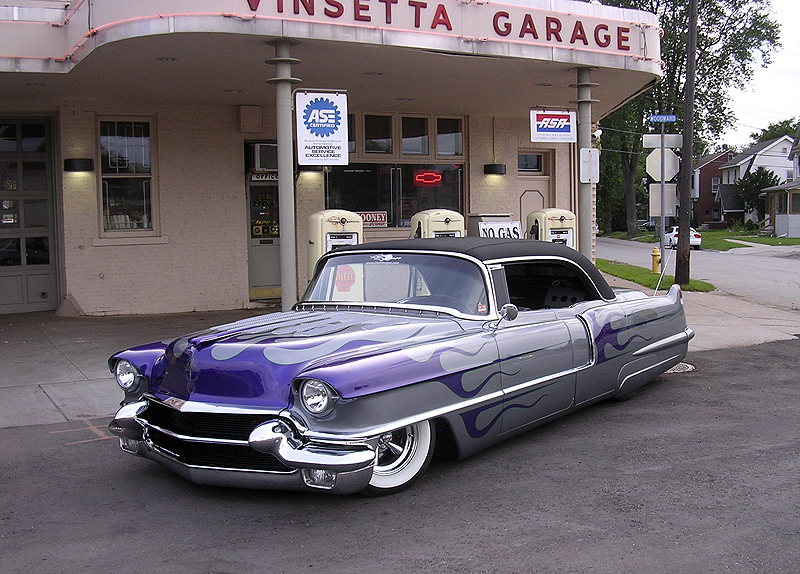 1960 Cadillac Custom I should be thinking about. So what can I create in the spirit of Rocky’s bug, but completely different. I have always loved 50’s chrome and fins and wouldn’t it be quite a contrast to take one of Detroit’s dinosaurs and repackage it into a much more manageable form? What about another Cadillac? Should I cut up the 60? Probably not, it’s much too nice of a car. Plus I want something new to look at. How about something really unique that you don’t see all of the time? That would rule out a car from GM or Ford. What about Chrysler? Now there is a company that really had some outlandish ideas. I think a chopped down Chrysler might be the ticket. There is a junkyard in Northern New York that has been there since the forties, kind of a sleepy place and it’s never had a car crusher in it. There has to be over 3000 cars from the thirties though the seventies. I’m sure they would probably have the fodder I would need to build a chopped down Chrysler. 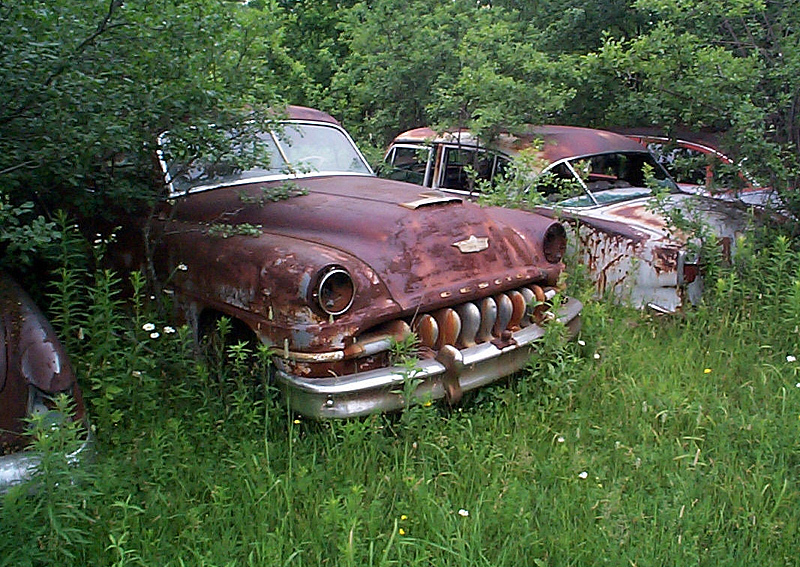 Most likely any car I find there would be rusted from the beltline down or at least the rockers and floor would be gone. What does that matter if I am just hanging some body panels on a little open wheel roadster? 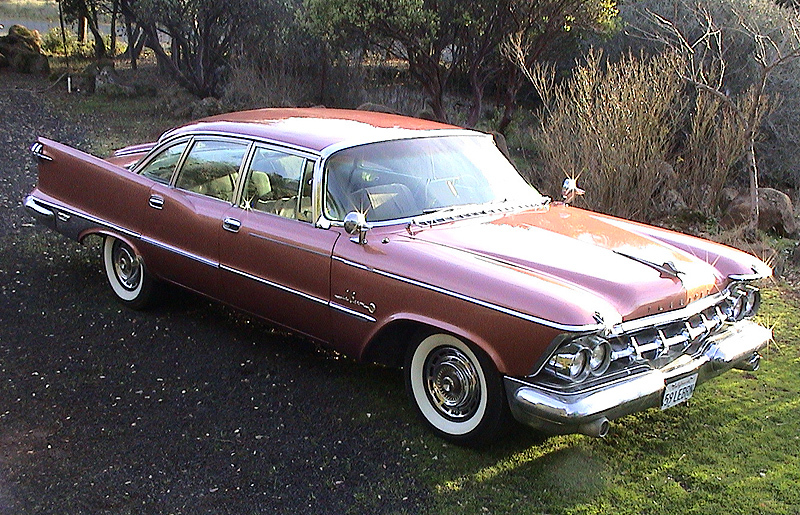 So with a loose concept in mind and a possible source for body parts I start looking at what Chrysler had to offer in the late fifties and early sixties. 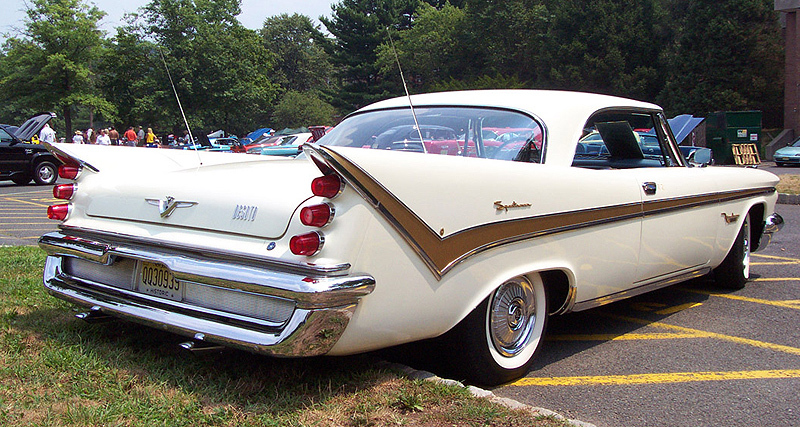 Desotos had some great body lines, the ’60 has a fin that came all the way to the mid point of the front door, the ’59 has a better side lines with outlandish trim on the fins and a nice front end. 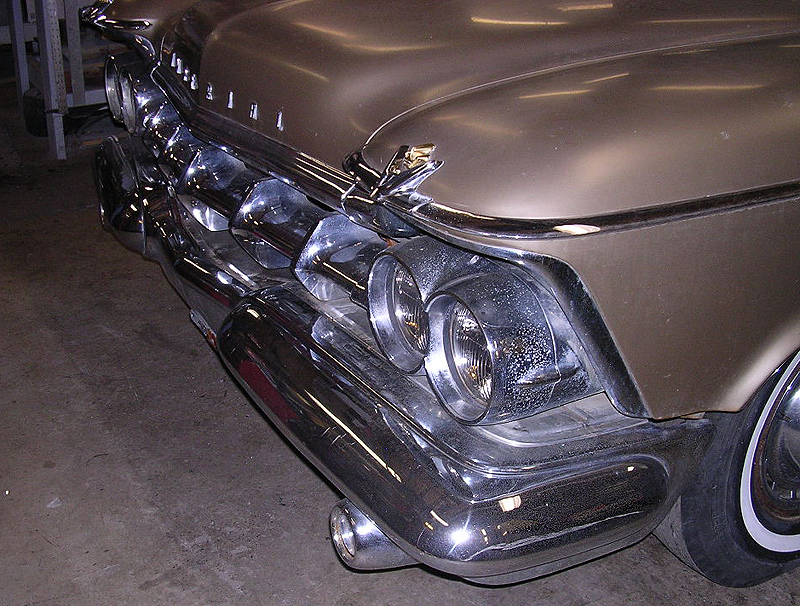 The ’57-’59 Plymouth Furys are cool, but they always remind me of “Christine”. 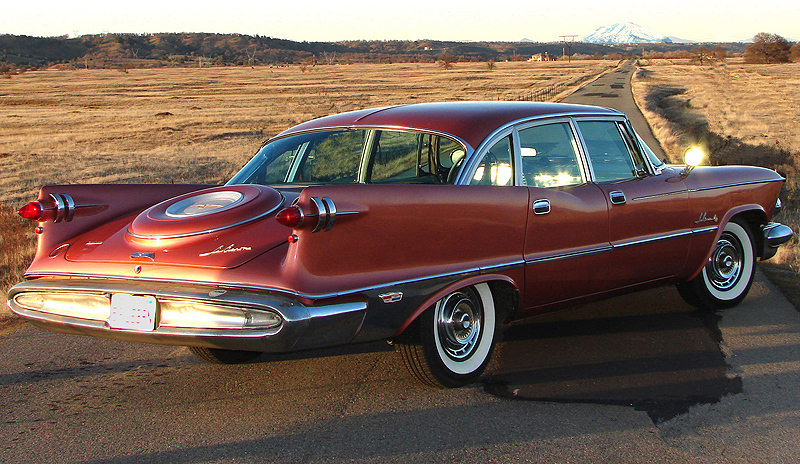 The ’60 Plymouth is just too goofy. 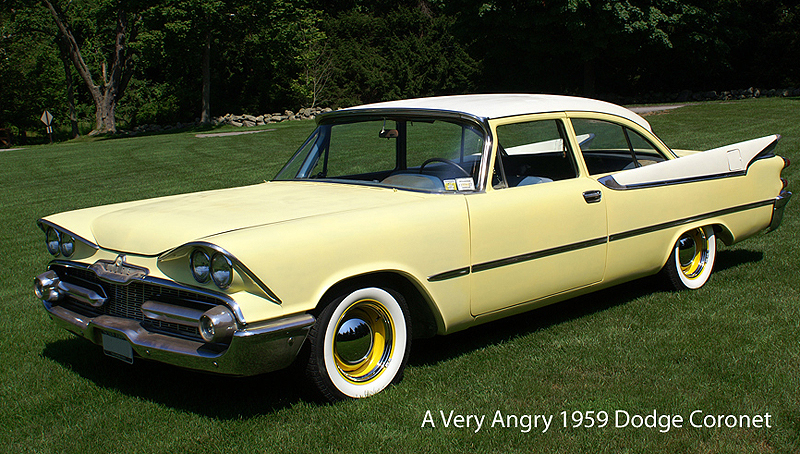 Now the angriest looking car ever made has to be the 1959 Dodge Coronet. Something really pissed off that car! And to match the scowl, it has dangerous, pointy tailfins. There are lots of directions to explore here. At the top of the Penta Star heap is the Imperial. 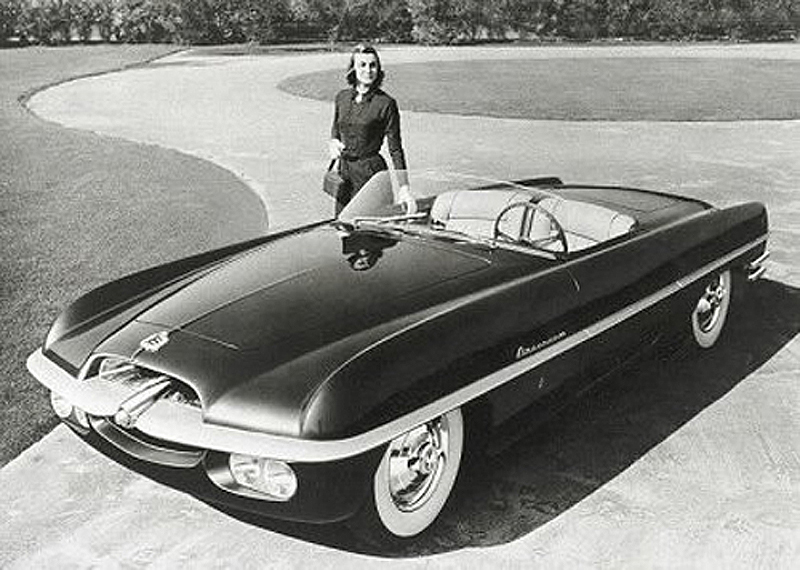 As I would come to find out later these were hand built in Hamtramck, MI and more expensive than a Cadillac or Lincoln. They exuded the height of luxury with electro-luminescence gauges, cruise control, swivel seats, and the first cars to have curved side glass. I always found their “gun-sight” taillights, stamped spare tire trunk lid, stainless steel roof insert, and floating headlights intriguing. As I began to compare a few different years I keep coming back to 1959. From the front to back it really has a lot of beautiful details, but just too much ugly in between. So I started some drawings and subtracted sections of the car. 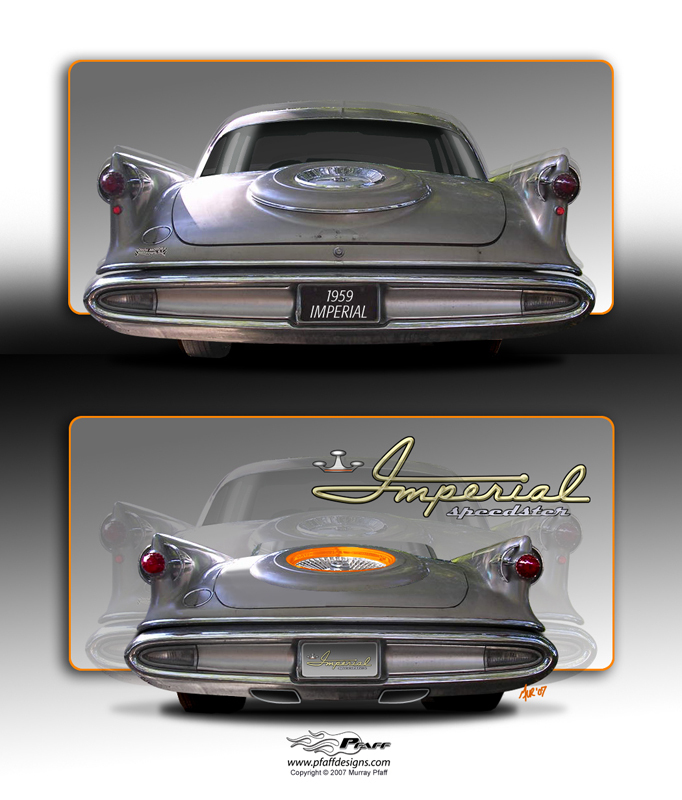 The Imperial was hand-built in Hamtramck, MI. That's a lot of metal! Starting with a four door car, figuring they might be cheep and plentiful, I shortened the wheel base by removing the front doors. My plan was to keep the rear doors because the tail fins started there. I shortened up the rear end, removed the roof and created a short little windscreen – much like a speedster from the 50’s. Up front I kept the length of the front fenders and filled in the wheel openings as hood sides. I added some lake style headers and steelies with wide whites. After playing with the combination a little bit – I had a nice, simple, little roadster. I imagined it with unfinished welds, flat paint, and a little rough around the edges. It was the type of car that wouldn’t have to make any excuses for its crudeness – just a whole lot of attitude. 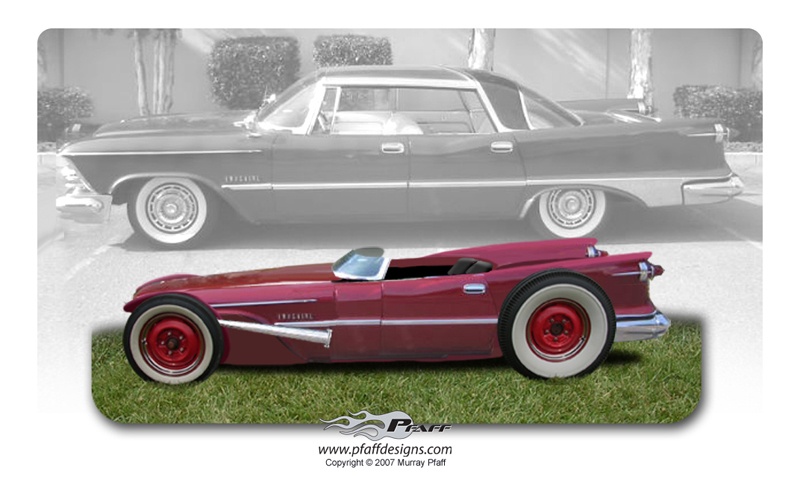 A quick rendering of a roadster made from a 1959 Imperial. 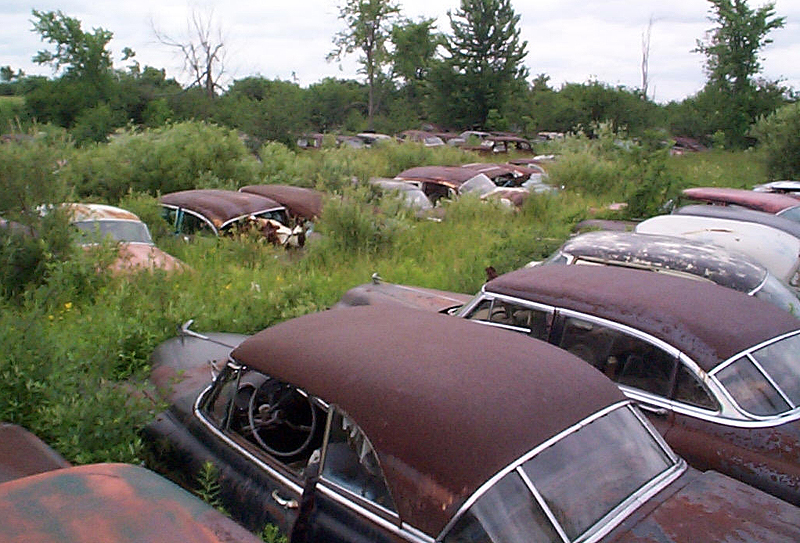 There is a traditional hot rod show near Chicago called the Hunnert Car Pile-Up. For the past five or six years a number of 30’s cars have showed up with 50’s fins grafted to them. Ed “Newt” Newton has also drawn a number of wild configurations with some of them turning into Ed Roth creations. All kinds of crazy things have been done to open wheel roadsters, but as best to my knowledge this is the first time a full size automobile has been reduced to it’s most elemental components. Now I will be the first to admit that drawing a cool little car and building one are two completely different things. Thousands of hours can separate the two. Meanwhile a good drawing or plan can save a few hundred hours over the course of a project. Not to mention a rendering provides great motivation and illustrates your vision to all involved. Plus, without one, everyone just might think you are crazy and you just might doubt yourself as well. So my buddy Tom and I head down to the Indy Goodguys to check things out. I have never been to it and he grew up just a couple of miles from Indianapolis Raceway Park (IRP) where everything is held. 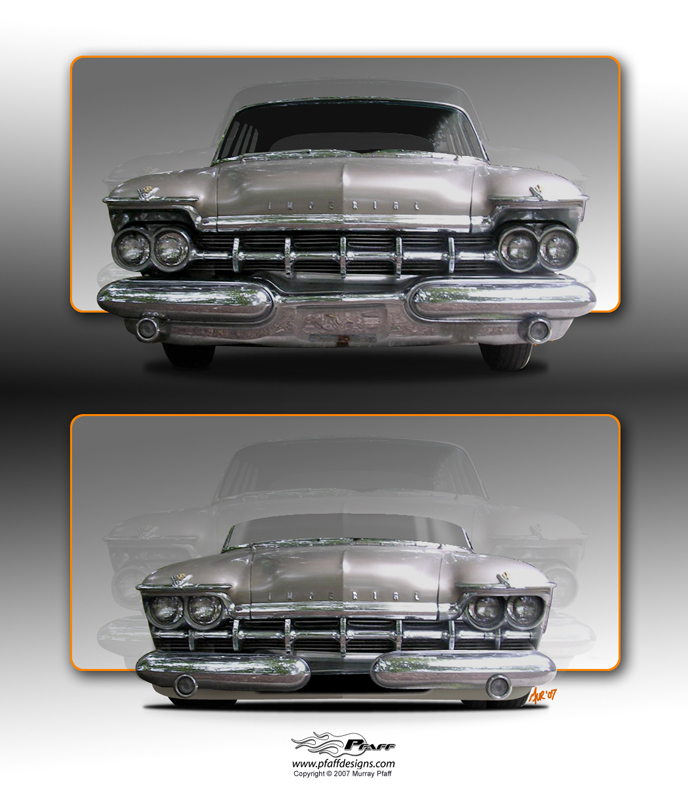 It’s been almost a year since I completed the makeover of my ’56 Cadillac Sedan de Ville known as “FireMaker”. It’s pretty cool to have Tom along for the trip since he helped to rebuild the car and now can finally enjoy it. It is a great highway cruiser with lots of room and style. 500 cubic inches power is rotating under the hood, 10,000 watts of tunage in our ears, and 4 hides of leather under our butts. We are just living the American dream in the hot rod lap of luxury. It’s Friday and we pull into the show. We troll around the main ring in the car checking everything out. Make a stop at Air Ride Technologies (now Ride Tech), say hi to Moose and Troy at Rad Rides, and look for a place to dock the land yacht. Things are filled up pretty good by power-parkers so we shoot for a spot in the middle of the grassy field a little ways from all the other cars. The Cadillac always looks so good slammed to the ground, and tall grass just makes it look that much lower. After a quick rain storm we dry the car off and decide to take a walk around. IRP is a pretty cool spot with the dragstrip, grassy parking areas, and midway for vendors. After a quick walk through the commercial vendors, we look around all of the shiny rods, and some not so shiny cars. Now I have always wanted to have a rough around the edges, lots of attitude, don’t worry about it kind of car. And this sort of attitude is one of the reasons I did a make over on the Cadillac that I have owned for 18 years. It started out to be a suede painted, Mexican blanket covered interior re-do. 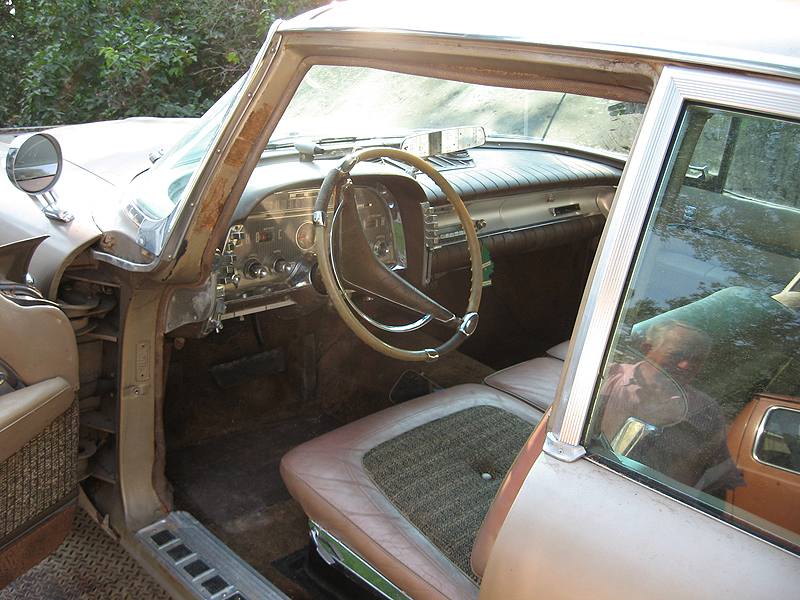 It sure didn’t end up that way, before I knew it, I was preparing for shiny surfaces, new chrome, and leather interior. So much for good intentions. In the end I am thrilled with the results, but still long for “rough rod”. As we make our way around Tom and I talk about car projects. He wants a 30’s rod with patina. He would love to find a Gardner (his last name). A few exist, but he hasn’t found any in a price range that you wouldn’t feel guilty about hacking it up. As for me, rods are neat, but have never really gotten me that excited. I dig the type of cars that have been showing up at the Hunnert Car Pile-Up – little rods with 50’s tail fins grafted on, but they are still 30’s cars – not that exciting to me. Then I see it. What you ask? It’s the inspirational moment for the Imperial Speedster. I didn’t know it at the time, but I knew it was cool, and different. It was not necessarily the car itself, but what was done to it, and how it was done to it. It was a VW Beetle. Now Beetles have never gotten me that excited, my sister had a convertible which I drove a few times, but I always felt like a dork behind the wheel. No, this one was different, it had an “I could give a crap about what you think” attitude. It was built just for one guy – its owner. Just the way a car should be built. 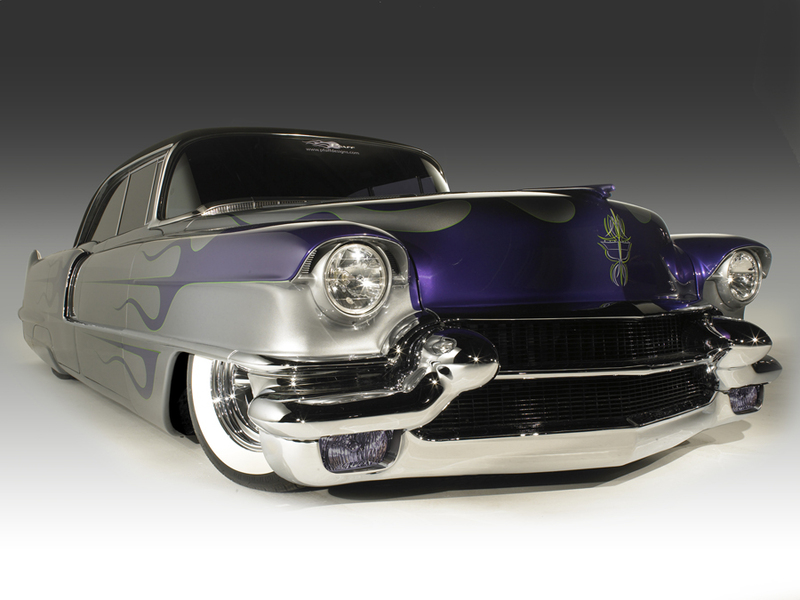 Custom cars and hot rods are the ultimate personal statement and ultimately they only need to please one person. 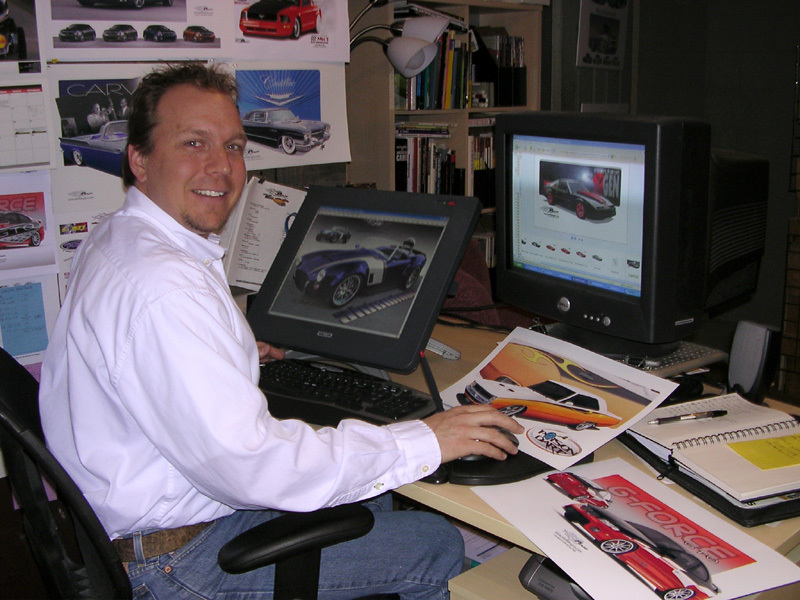 Too often I find cars are being built to please others – show goers, editors, judges, and others. This is where they fall short. In trying to please everyone, you don’t please anyone. We might as well paint every hot rod red, black, or yellow and bolt on torque thrust wheels. Cars should make a statement. They should tell you a little about the person who owns, or built it. They shouldn’t be perfect. They certainly weren’t when they came from the factory. We fall in love with cars for their quirks, oddities, and imperfections, as much as their beautiful lines and forms – this has to be the reason so many people love English sports cars. Love it or hate it, this car demands that you look at it. Like Frankenstein’s monster it was chopped down, all of the scars from the sawz-all were visible due to the unfinished welds. It’s mostly green with spots of gray, brown, and red – possibly fresh road kill that had dried months ago. Big red steel wheels and headlights from a luxury 30’s cars exaggerate the cars overall appearance along with the flat windshield header and chopped folding top. It’s just my kind of cool.